Amazon, which he founded in 1994, is now vying to become the world's first trillion dollar company, having transformed from niche second-hand book seller to global jack-of-all trades. But Mr Bezos, now the world's richest person, claims higher aims than just reshaping the world's retail market. "It wasn't about money itself. It was about what he was going to do with the money, about changing the future," she told the magazine. Signs of Mr Bezos's ambitions emerged decades ago. In a 2010 speech at Princeton, Mr Bezos recalled his decision to head west and start Amazon as the "less safe path". "I decided I had to give it a shot. I didn't think I'd regret trying and failing. And I suspected I would always be haunted by a decision to not try at all," he said. Mr Bezos's gamble, funded with more than $100,000 in personal and family money, quickly paid off. Within a month of Amazon's 1995 launch, it had already shipped orders to all 50 states and 45 countries, according to Mr Stone's book, The Everything Store: Jeff Bezos and the Age of Amazon. In Amazon's first five years, customer accounts jumped from 180,000 to 17 million. Sales skyrocketed from $511,000 to more than $1.6bn. Big-name investors flocked to the company amid the first wave of dot com enthusiasm. 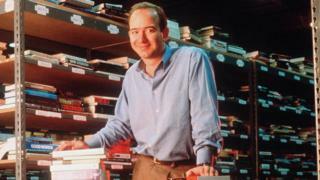 It went public in 1997, raising $54m and turning Mr Bezos, who once helped to box up the book orders, into one of the world's richest men before the age of 35. In 1999, Time Magazine named him one of its youngest ever 'People of the Year', dubbing him the "king of cybercommerce". Known for being an exacting boss, Mr Bezos has guided Amazon with what he describes as a long-term strategy and "heads down" focus on the customer. But Amazon also hasn't hesitated to save where it could, making headquarters employees pay for parking, battling with suppliers, opposing efforts to organise labour unions at its warehouses, and avoiding taxes as much as possible. The firm is expected to account for roughly half of all online shopping sales in the US this year - and nearly 5% of the country's overall retail market, according to research firm eMarketer. It employs more than 575,000 people - a force nearly the size of Luxembourg's population. It provides logistics, storage, loans and a selling platform to hundreds of thousands of third-party merchants and its profitable cloud computing division, which hosts huge swathes of the corporate world on its data servers, is the industry's global leader. Nor is Amazon's thirst for new ventures sated. Amazon's rise, as former retail stalwarts like Sears, Toys 'R' Us and Barnes & Noble struggle, has drawn critics concerned about its monopoly power, its tax and labour practices - even its responsibility for driving up housing costs in its hometown of Seattle. When the firm announced last year it would build another major campus in North America, local officials scrambled to win the firm's commitment, even as protesters, angry about the prospect of tax incentives going to one of the world's most successful companies, mounted anti-Amazon campaigns. Mr Trump also frequently ties Amazon's activities to that of the Washington Post, although the newspaper is an independent, private investment by Mr Bezos, who purchased it in 2013.